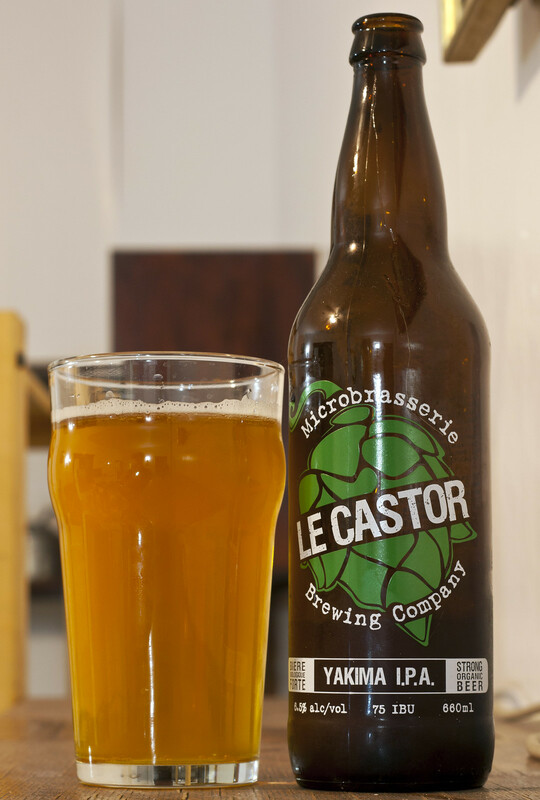 I've apparently never had any beer from Rigaud, Quebec's Microbrasserie Le Castor before. Rigaud is a small community not far from Ottawa and Montreal with a population of 7300, about the size of Morden, Manitoba.. but you would never see Morden start up a microbrewery.. one thing I love about Quebec. Le Castor Brewery is a certified organic brewery, one of the first of its kind in Canada. I don't remember the last time I've had an organic beer from Canada. So hey.. it's cool! Their Yakima IPA pays tribute to the Pacific Northwest, one of the largest hotbeds for hop growing on the planet. I can already imagine this IPA has a great Cascade forward bitterness, can't wait! Appearance: Le Castor's Yakima IPA pours a rich hazy golden IPA, Minimal amount of white head. Looks like a very solid IPA all-in-all. Aroma: Scents of freshly ground pepper, cascade hops, light grapefrutiness, lemon and a smidge of sweet caramel malt. The pepper spice burns my nose and I love that! The spicy pepper-like aroma is so strong I can feel it down my throat... damn. Taste: Reminiscent to a true West Coast style IPA, hops are first and foremost in this beer. The fresh ground pepper scent brings the spiciness forward in the flavour as well, I feel a bit of heat at the back of my mouth from it. Nice alfalfa floral flavour, just like most Cascade-forward ales. A bit of a sugary-sweet aftertaste. Overall Thoughts: A very solid take on a West Coast style IPA from the folks over at Microbrasserie Le Castor Brewing Company. They don't cheapen out on the hops and the flavours are quite all over the place, sweet, spicy and overall nice! One of the top 5 IPAs I've ever had out of Quebec so far! Easily a 4.5/5 rating out of me for Untappd! 6.5% ABV, 75 IBU, this will help with an early autumn cold and then some!